Not only do I not know who this Anna is (no last name, no return address), but I don't know what the "thank-you" is referencing. Swap-bot? 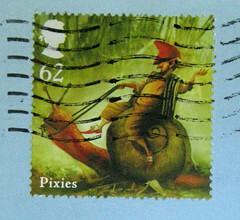 Postcrossing? Or did she just match the wrong name with my address? Mail tips: be specific in your references, and use a return address. Anna, if you see this - enlighten me? I have a stack of mail in a basket I've labeled with a big ? because I have no idea who the sender is and in some instances, it is signed with just an initial. I'm not Anna (or Karen) but I do live in Oregon, and I would like to say a few words on Anna's behalf. Here in Oregon, we didn't even get a decent summer last year (not one red tomato!) before it launched into the nine months of rain and gray skies. It's dark and gloomy, and you start to forget who you are and who other people are, and wonder why it is you don't live in New Mexico. Tomorrow the sun is supposed to come out though. At that point, Anna will realize her mistake and wonder what she was thinking. Really strange... Some time ago my card to the USA was accidentaly sent to another state. Christine, enjoy the sun today. Your comment made me laugh out loud. Oh man ... Christine's comment made me laugh, too. 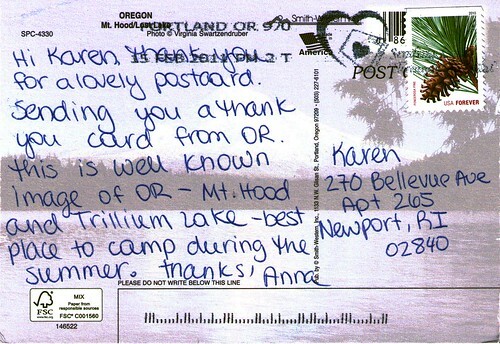 And I think I should rush to my address book and send EVERYONE in Oregon a bright cheerful postcard! I have no idea, but Christine's comment certainly makes an excellent excuse! Ha, Oregon sounds like Canada! But all the darkness and gloom makes you appreciate the sunshine even more. This is a fabulous thread. The explanation is priceless.